In my view, one of the highlights of the Jewish year is the festival of Sukkot (סוכות‎) when the children from our Cheder (חדר) gather to build the Sukkah (סוכה) – the temporary dwelling place and shelter that is open enough to see the stars. This year we have a new and enlarged Sukkah – thanks to the Lipshaw family who funded the enlargement in memory of Daniel Lipshaw z”l – making more room to accommodate the increased numbers of children attending our Cheder in recent years. So we needed plenty of greenery, fruit, vegetables, and willing volunteers to decorate it in style. So it was that at the appointed hour a number of the Cheder children, with their parents in tow, gathered at our Sukkah and with lots of enthusiasm – not to say a flair for creative decorating – set about decorating the Sukkah. Self-organised teams set to work – preparing the fruit and vegetables; decorating the walls; and covering the roof – all done with lots of smiles and good humour. With the Sukkah fully decorated it was time to time to say the traditional blessings, shake the Lulav (לולב‎), and share bread in our temporary shelter. Afterwards we were joined by Councillor Paul Canal – from the London Borough of Redbridge – who shared our Chavurah (חבורה) or communal supper. 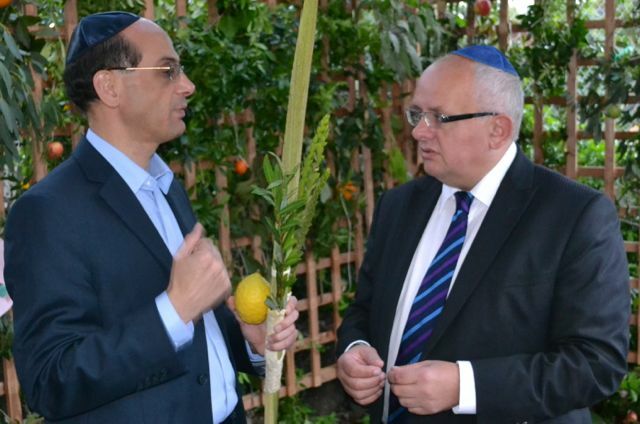 He also joined Rabbi Richard Jacobi in the Sukkah to learn more about the festival of Sukkot, the Sukkah, and the shaking of the Lulav. The evening finished with a short service to celebrate the Sukkot festival; there was also time for Councillor Paul Canal to visit the Cheder classrooms to see some of the work done by our children, and to learn more about our plans for the future of Woodford Liberal Synagogue – including the proposed refurbishment work. Thereby moving from our temporary shelter (decorated by our Cheder children) to our plans to ensure our permanent home is made fit for purpose for generations to come.